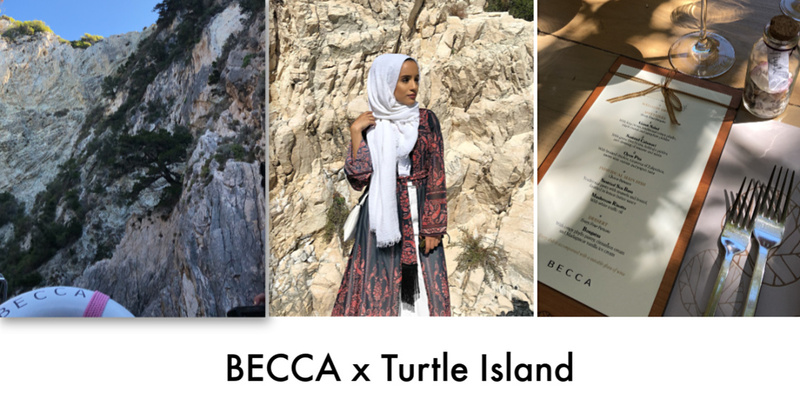 SAFIYAH TASNEEM : #BeccaScape - My First Ever Influencer Trip! When I first received the invite email I couldn't believe it; little old me, being asked on a trip?! Whilst I am confident my blog has steadily been going strong for 8 years now, Instagram has a way of making you feel like you're not worthy if you don't have over 50 or 100k followers, so yes I felt "small" and still do regularly when I feel like some brands only look at instagram figures. Once I got over the shock of being asked, my immediate question was wondering: will I be able to get babysitting? I've mentioned about being a single mother before on my blog and youtube here and there, but don't share too much of my private life nor do I share my son as I feel like some things should be private; but being a single mum does mean opportunities have to often be missed and I had to figure out if I could actually arrange babysitting for this trip especially as I am slightly overprotective with my son and can't just leave him with anyone. Luckily for me, my family pulled through and my heart was settled as I knew they could be trusted and that my son would probably be spoiled too much if anything if I don't give boundaries/instructions lol. But even then, I told myself not to get too excited in case something happens last minute. I think I do this often as a coping mechanism or something, but when you're a mum things like your child getting sick etc can happen, so it just works for me to think this way. As I neared the date of the trip, the next thing to worry about was clothes! I'm sure every person worries about clothes at one point of their life but as a hijabi going to a fairly hot climate (30 degrees) and not in the slightest being fashion confident, I was mildly panicking. The theme was Boho chic (but not strict); I was glad though as it could totally be hijabi friendly and thanks to my friends and cousins I managed to pick some outfits for the trip (see end of post for some links). The trip was essentially only 2 days - but as I knew I would be the only hijabi on this trip I felt very conscious of my fashion choices. The PR lady Roopa for BECCA was an absolute darling via email, ensuring she would make me feel comfortable and that I don't need to partake in anything I don't want to. I'm a natural worrier so I did wonder if my son would miss me for the two days (despite my family assuring they had plans for him), if I'd be over luggage allowance and if I'd end up being a loner as I only knew Gary (The Plastic Boy) and Really Ree.. amongst other regular things like makeup looks to do lol. Luckily both of these lovely souls were at the airport when I arrived and Ree kind of took me under her wing as we checked our suitcases in (and at various points of the trip too), which made me feel much more at ease, bless her! Going through airport security at Gatwick wasn't the most pleasant; when I look back at it I understand it probably looked suspicious that one British Muslim girl with a headscarf on was travelling to Greece with what looked like no other Muslim person. Luckily the lovely Amy from Byrdie beauty was standing next to me at security/hand luggage check as I was getting questioned about the possibility of carrying "chemicals that could be used for explosives". I did realise as I waited in the lounge to board the plane that I was the only Muslim person on this flight, so it then made a little sense for airport security to check my story, but still annoyed me a little that they didn't just ask me directly. Of course there were odd looks here and there from other passengers in the waiting lounge, but it was way too early in the morning (5am) to care too much. Anyway, I'm an awful sleeper on planes so didn't get much rest in the 3 hour flight, but we arrived at our hotel and as we were shown the hotel, I breathed my first sigh of relief and felt the tension ease a bit - it was a dream! 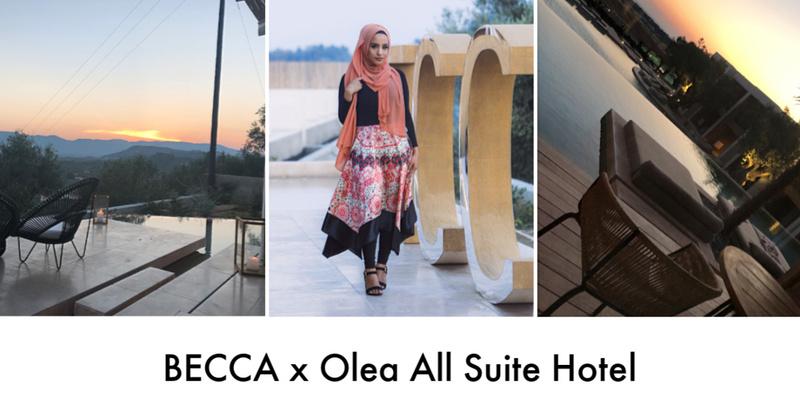 The Olea All Suite Hotel had only opened earlier this year and the views were beautiful; it felt like I could finally relax. We went to our rooms to freshen up for lunch and found cute personalised PJs and accessories; I wanted to change and look more alive but my suitcase didn't come in time before lunch, so I just used the bag and flipflops given to us to change up my look a little and did look like a bit of a hot mess, but I'd not slept in 48 hours, so I just tried to avoid pictures and play with the base products we were introduced to by Kerry from BECCA. 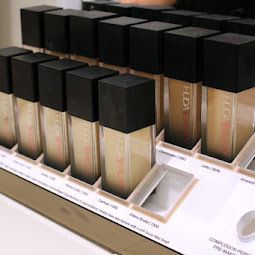 I wanted to find my shade amongst the mixed foundations and concealers laid out, but some had been mixed up by the time I got swatching so I will try to find them out and let you guys know ASAP! We then had optional yoga which I did pack for but was too exhausted to do; I just wanted to nap before dinner plans tbh so I went back to my room but ended up facetiming my son who was showing me his Lego I'd bought him (which he is currently obsessed with!) and not too phased about me being away whilst he had that to focus on lol. Thankfully these little in between breaks meant I could do my combined salah and made me grateful that I could shorten coz boy was I exhausted! We had the view of the sun setting into the mountains on one side and the sea opposite it - it was literally breathtaking. The food was ah-may-zing. BECCA really went all out for this trip and as a foodie I appreciated what felt like a 10 course meal; I don't think I've ever had so many courses in my life! I chose the seafood options and obvs had to check if the dishes had alcohol but they didn't, so it was amazing to truly appreciate fine dining and even though I was slowly getting fuller and fuller I somehow found space for dessert - which left me feeling super satisfied despite being light and fruity. I was sat with lovely girls as we waited for the courses and chatted about everything from pets to the World Cup (which was pretty much just Ariane from BECCA lol); there was even time to make some "worry beads" which were kind of like tasbihs but have no religious purpose and were just a cute touch. I dragged my body to my room after hitching a ride on a buggy and facetimed my son again before his bedtime (the time difference was perfect as we were 2 hours ahead). 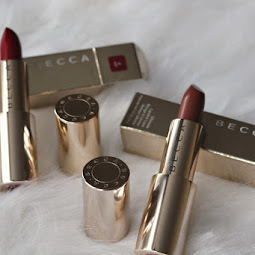 I then discovered that some BECCA goodies had been placed in my room so I somehow found energy to go through them on my IG story; I really must be a zombie as I was beyond shattered by this point but slept pretty well until sunrise. The next morning I woke before my alarm at sunrise as there was the loudest chirping reverberating off the walls. I was so sure I had a cricket in my room, I called the front desk and was told crickets do have "loud voices" and that it's probably outside, but they'll get housekeeping to check. We had a lovely healthy Mediterranean breakfast (Greek Yoghurt and fruit is my jam in hot weather!) and then we were ready to leave straight for our planned boat excursion at the sea. Our group was split into two speedboats and the views of the sea and the huge rocks/caves around "turtle island" were absolutely stunning.. it really made us feel so tiny in comparison! We stopped on this island for a bit of a swim break for those who wanted to and for a little photo shoot session, but this part was not really for me as I actually cannot swim and there was no proper private place to get changed into my modest swimsuit, so I just sat there in my clothes and watched while the others did their thing and enjoyed the water. We took a group photo/boomerang here and I did think that I would stick out like a sore thumb in my hijab and clothes but as some of the others still had kaftan/cover ups on it didn't look too obvious in the end. Lunch was another yummy affair, this time in town at Prosilio - with more seafood (and more offerings of wine that I waved away lol), but totally elegant and left me feeling very satisfied and full. 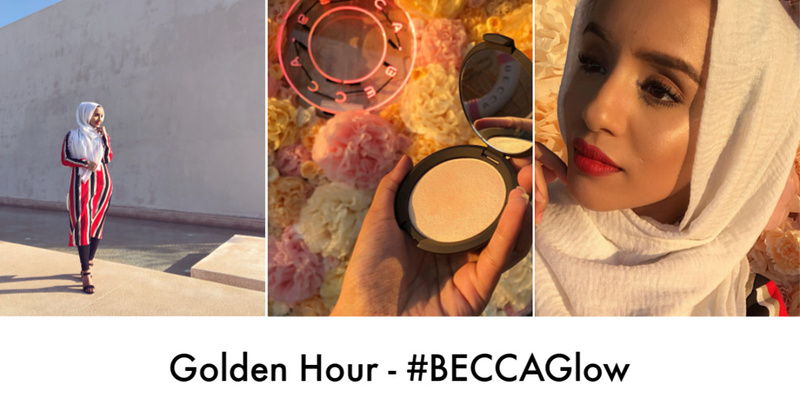 We then headed back to the hotel to freshen up/get ready for our Golden Hour tutorial session with Nikki Makeup, who, in case you didn't know is the Global Makeup Ambassador for BECCA and someone I've followed for years and adored the makeup style of! She showed us her beautiful glowy skin tutorial on Alex Steinherr, using all BECCA products including: the new Glow Elixir, First Light Priming filter, the new Skin Love Blur foundation, Liquid Shimmering Skin Perfector in Moonstone and the Powder Shimmering Skin Perfector in Opal. Dinner was by the sea this time and super cute and magical with the lights and a jungle-ish vibe with all the leaves and plants around us. 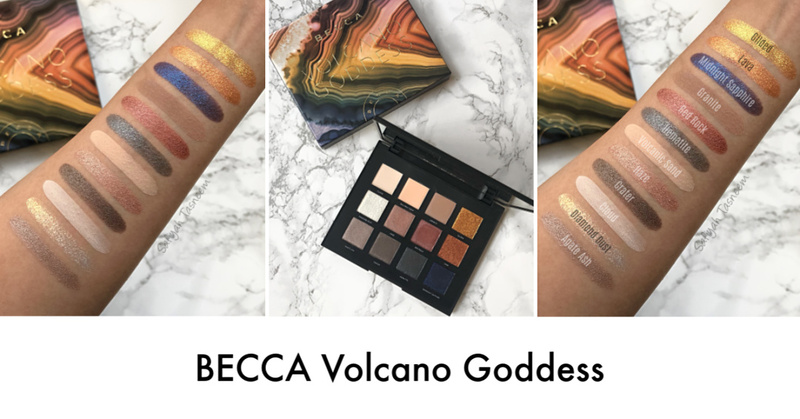 We then were given an exclusive preview of the new and limited edition BECCA Volcano Goddess palette (swatches below) - the first ever eyeshadow palette they've ever made! The palette is inspired by unearthed gemstones (which ties into their highlighter names' theme) and of course molten lava from volcanos. The shadows are all super pigmented and come in 3 different finishes: ultra matte, shimmer and molten metallic. My eyes were instantly drawn to Midnight Sapphire in the palette and the other molten metallic shades although Gilded and Diamond Dust reminded me of the Huda Beauty "textured" shadows from the original palette that I wasn't overly keen on if you guys remember in my review here. These molten metallic shadows are less flakey than the Huda textured shadows though and like the Huda palette, I feel they would be better used with the finger, particularly Diamond Dust. 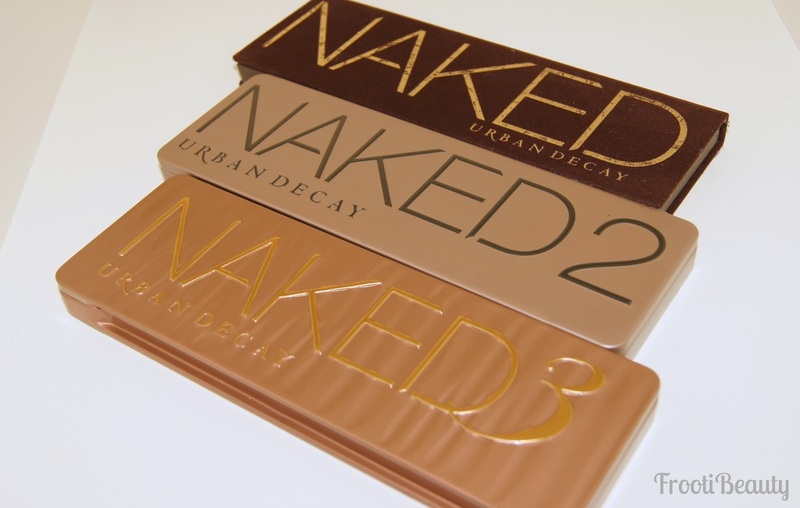 The ultra mattes are super pigmented and soft, as are the shimmer shades and they do resemble volcanic rock and stones (reflected on the front packaging). 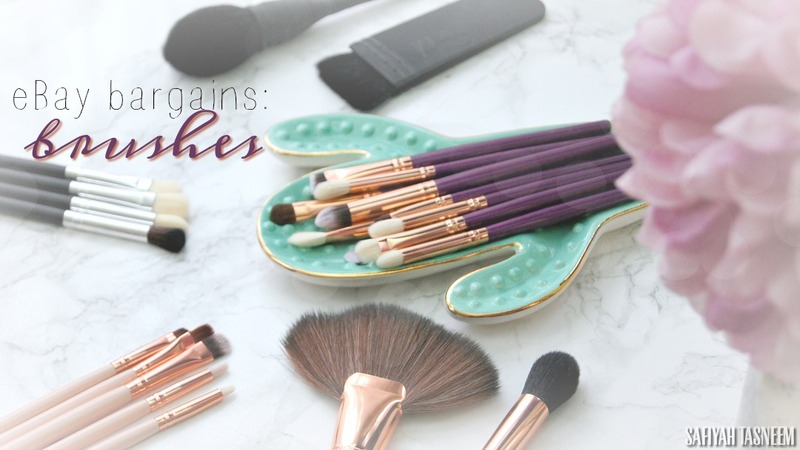 The palette has a nice mix of warm and cool neutrals and a few brights and is definitely worth investing in if you're likely to wear these shades for everyday wear or occasions as a little goes a long way and you can create subtle sparkly looks with the molten metal shades or heavier metallic looks too. We then ended the night with a cute little montage video of our trip on the beach with a huge screen and then beautiful fireworks! After breakfast the next day we caught our flight back where this time I didn't get pulled aside and questioned, but my hijab (and only my hijab) was scanned with a detector at security. Thankfully it was nothing more but again I found it silly and held back from rolling my eyes. As soon as I was on the plane I was longing for time to go faster so I could see my boy again and get a big hug even though it had only been 2 days! Once I was reunited with him I felt whole again (cheesy but true) and he told me all he had gotten up to whilst I was gone, which made me feel so proud that he's super confident alhamdulillah. Although I was exhausted, I felt content about the whole thing, not just as a little break, but on a deeper level I felt happy to be representing hijabis on this trip. I received so many messages/comments on Instagram in the two days, some saying how they were proud or happy because they usually feel out of place at events etc and that it was refreshing to see someone in hijab and staying true to ones self. I think it's normal to feel out of place sometimes and of course I did at times on this trip, but I feel like I'm at an age/time in my life where I feel confident enough to not care as much as I may have done when I was younger and it mostly comes from being a mum and knowing I have a bigger responsibility to set a good example to my son or younger girls who follow me. Yes it can be nerve wrecking being the odd one out, but I truly believe the saying that if you don't stand for something then you will fall for anything and when you look around a bit more deeper, you may realise you're sometimes not the only person standing up for your values. Hope you guys loved this super long blog post which sort of felt like a novel lol, but if it helps gain some insight into the world of a hijabi blogger or being a single mum and helps boost confidence then great! 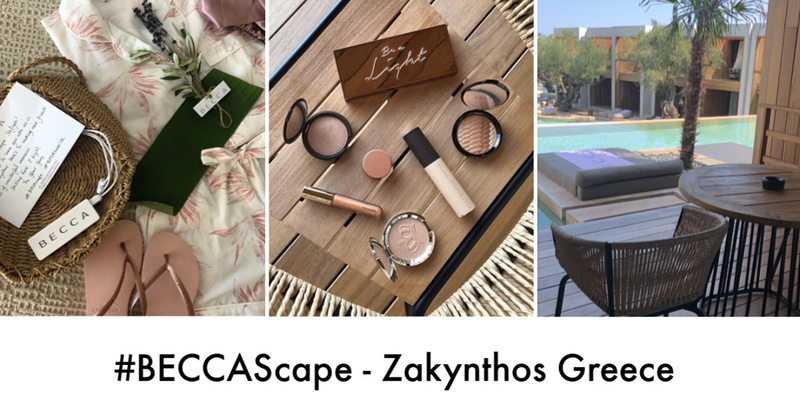 I also want to give a huge thank you to Becca Cosmetics for allowing me to be a part of this trip and helping me feel comfortable at all times.. and making memories! Aww thank you hun, yess I would love to do more positive/self love type posts as I strongly believe it's important for us women especially! Thank you for the bow cap, it's in the BECCA video on youtube!! Loved reading this! So happy you got to go on the trip!! You looked amazing, InnShaAllah you'll get to go on many more trips! I went into John Lewis today and impulsively bought the Be A Light face palette but also saw the Becca eyeshadow palette and it is stunnnninnnggg. However I felt I couldn't justify buying both and dragged myself away! 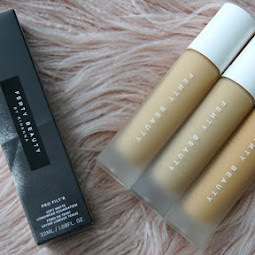 Ahhh the be a light palette is defo something I've incorporated into my regular makeup because it gives this subtle contour which I prefer to heavy contouring these days!